We hopped on a train with a Chinese friend, Autumn, and took a little cultural weekend trip a few weekends ago. His aunt hosted us in a very nice little country condo place. No English there, but our charades serviced us quite nicely. I am a sucker for a mop-headed dog. I am particularly fond of this fellow's nose. He's a classic. We were warned in our training about touching the dogs--they are supposedly flea-ridden. I haven't been too worried about the fleas with most dogs I've met, but they all seem to want to de-hand me. I take pictures and admire them from afar. Our first day's expedition took us to a 2,000 year old dam that is still holding. 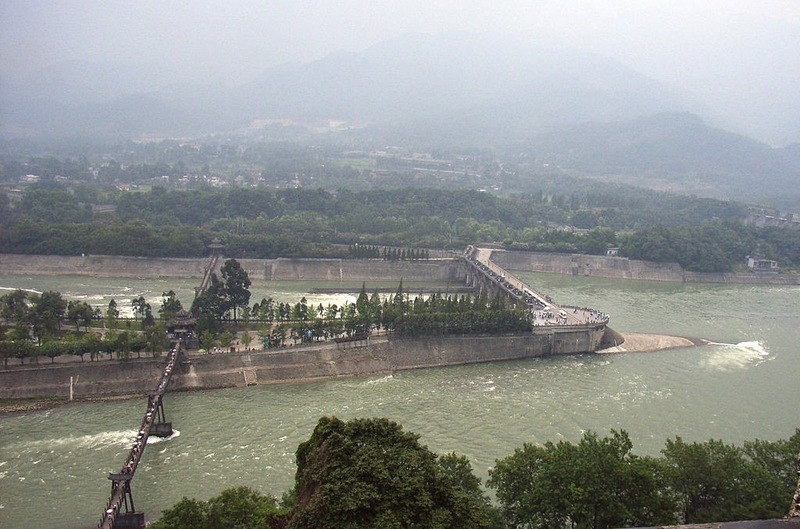 It's a UNESCO site--very famous--Dujiangyan. If it ever breaks. good-bye Chengdu. This was the first executive helicopter inspection stop following the 2008 earthquake. We spotted this pretty floral wreath on a little joy hike--an obvious remnant of a medieval jousting event...sooooooo many renaissance fairs here. yeah, right. I like to picture a young Chinese manboy placing this romantically on his damsel's fair head. Or maybe a crazy wind just tangled it together and whipped it up into the tree. I wouldn't be surprised if that monkey-written novel is around close too!! I ate two. Crunchy. The downside was that the little wings and legs stuck like popcorn kernels in my teeth that I had to keep fishing out. This is such a dandy accupuncture chart that I would be remiss to not include. There IS some accupuncture in my future. I just need a good garden variety malady--nothing life-threatening. Day 2. Ahhhhhhh....QingChengShan. 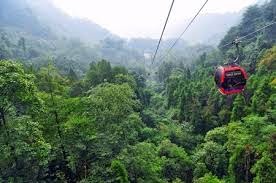 Shan is mountain--very sacred mountain--birthplace of Taoism. Let's Go!!!!!! Enlightenment awaits!! We clocked about 9 miles today I swear. The woosey Chinese take buses or cars up to the base, and then they hop aboard a sleek German ski tram. we reached the top! Magnificent 3 hour hike!!!!!! S, T & Th--put away that resthome application!!! We could have paid to go up this way. Not even!!!!! But we did take the tram down part of the way. And then Autumn took us to "Dr. Stone" for a foot massage! Rock therapy. Not for the pain skittish...but we lived to see another day. Beautiful pictures! I'm so impressed you ate one of those bugs!!! WAY more adventurous than I ever plan to be. No bugs for me thanks, but I'll hike up a beautiful mountain any time. Loved the pictures! It looks different! Greener. And, yes, I'm impressed you ate bug. Protein? ?